Description Having searched around the stream for "sign" of beavers- such as footprints in the mud or sand, these trappers are in the process of setting their five pound traps in beds they had dug with their knives. Each trap was tied firmly to a tree or a pole as well as a float stick that was hammered into the mud to the beaver could not carry off the trap. The trappers travel in pairs because of the continual threat of Indian attack. Extracted from "The West of Alfred Jacob Miller" (1837). In July 1858 William T. Walters commissioned 200 watercolors at twelve dollars apiece from Baltimore born artist Alfred Jacob Miller. These paintings were each accompanied by a descriptive text, and were delivered in installments over the next twenty-one months and ultimately were bound in three albums. 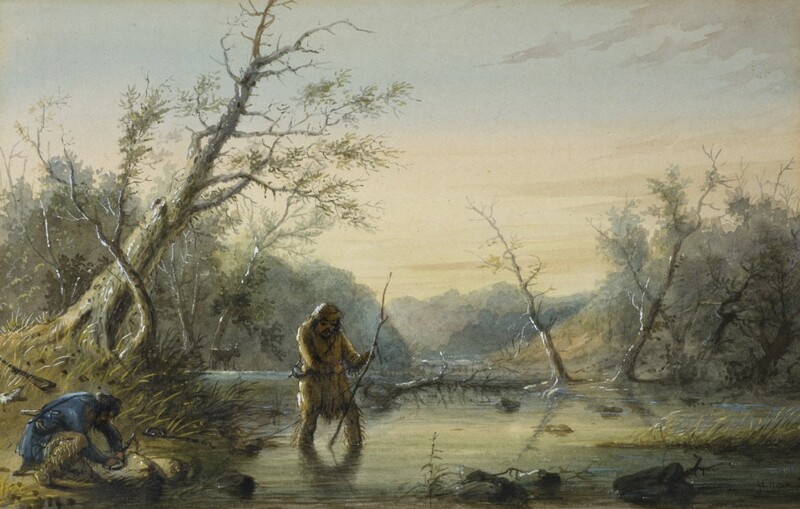 Transcriptions of field-sketches drawn during the 1837 expedition that Miller had undertaken to the annual fur-trader's rendezvous in the Green River Valley (in what is now western Wyoming), these watercolors are a unique record of the closing years of the western fur trade. Mountain Man. Buffalo Bill Historical Center, Cody. 1978. Opening the Way West. Katonah Gallery, Katonah. 1981. The Western Experience. The Monmouth Museum, Lincroft. 1989. American West: Out of Myth into Reality. Mississippi Museum of Art, Jackson; Terra Museum of American Art, Chicago; Toledo Museum of Art, Toledo. 2000-2001. Sentimental Journey: The Art of Alfred Jacob Miller. Amon Carter Museum, Fort Worth; Joslyn Art Museum, Omaha. 2008-2009.